I blinked, and another month went by. 4 months old! 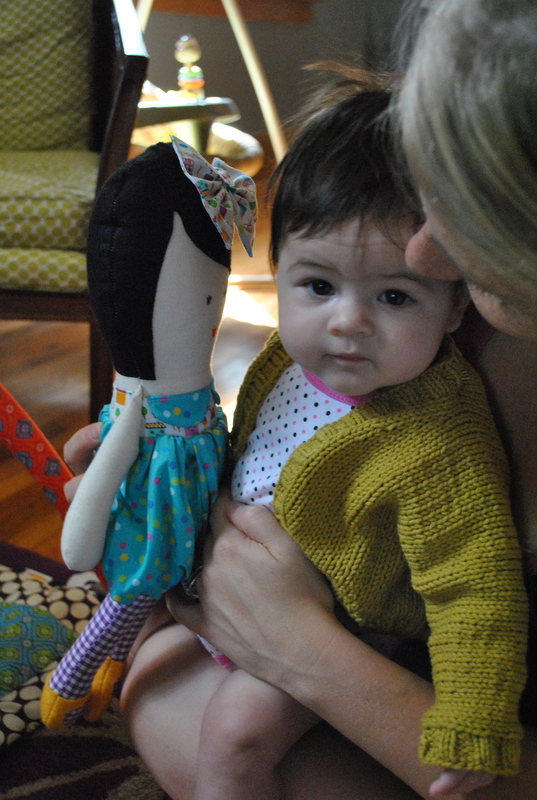 I knit a shrug for my little babybug. 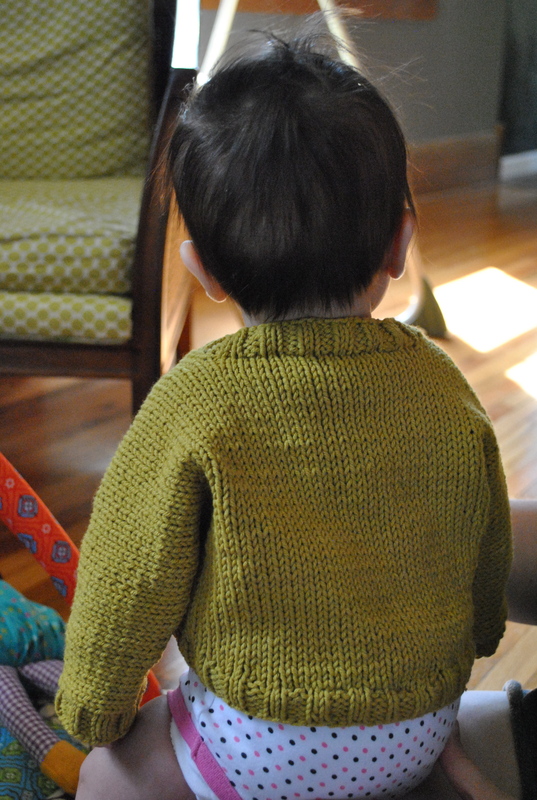 I finished most of it at my knitting night, while Iris stayed home with Dad. I held it up and thought ” Rats! I’d soo big, she won’t fit into it for a while.” Imagine my surprise, when I tried it on her the next morning, and it fit just right! Am I in denial that my little bebe is no longer so tiny? I think so. But she’s so so fun right now. 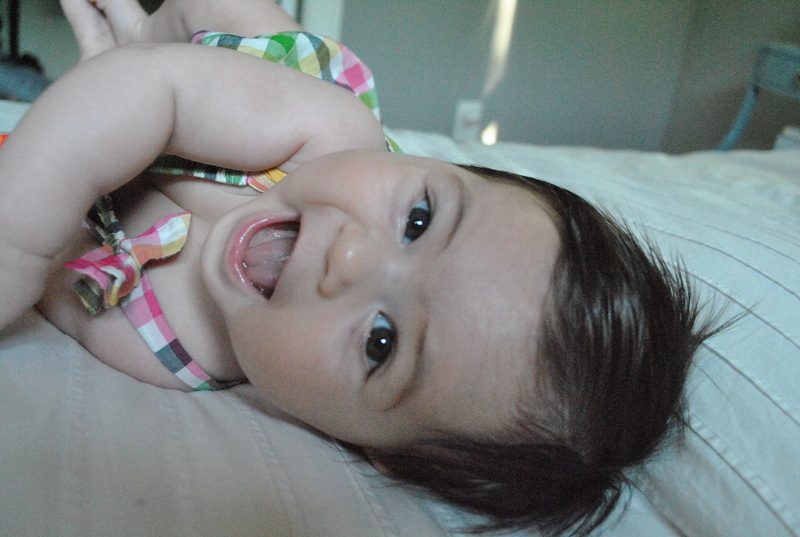 She’s giggly, and wiggly, and flips like a pancake when you put her on the ground. She learned how to blow bubbles with her baby drool, which is gross and adorable all at the same time. She’s got tons of rolls up and down her baby legs. It makes me sad that soon she will have to wear pants as the weather gets cooler. I love seeing her little drumsticks stick out of her summer clothes. sigh. Anyway, about the. I’ve been eyeing this adorable little project long before I had Iris, heck, long before I even met Mark! 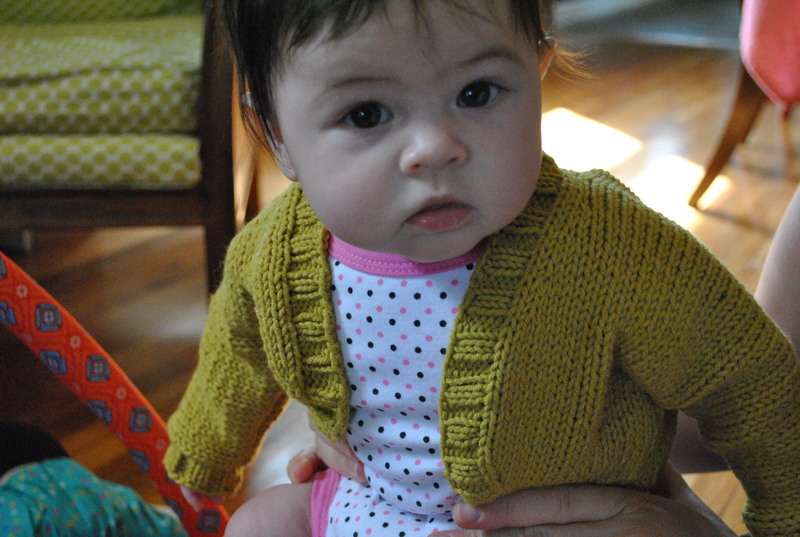 I was flipping through the pages for something to knit Iris that she can fit into right now, and BAM I saw it. For those curious, it’s from THIS book by Debbie Bliss. I used Cotton-Ease, in a new shade called “golden glow” that I picked up HERE. 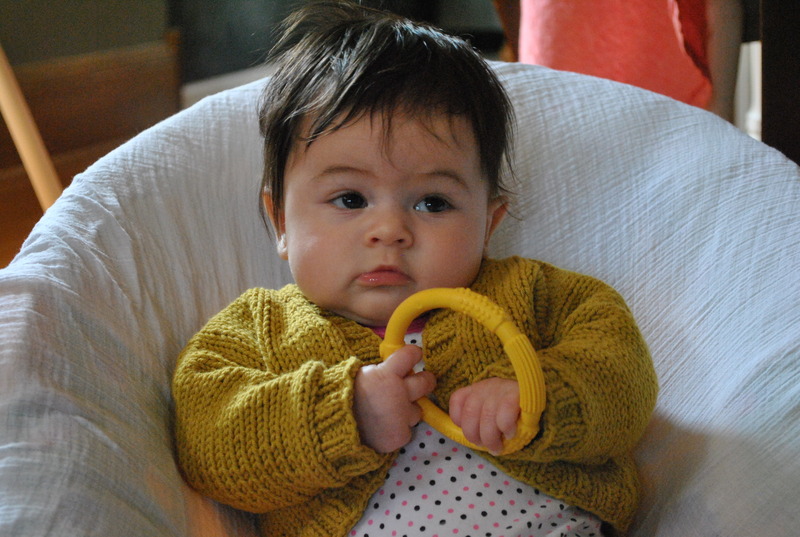 Only one skein for the 3-6 month size. It was extremely fun to knit. Fast and satisfying. And oh so wearable. Just throw it over a onesie and go! 🙂 Le knitting ss than a week on the needles from start to finish. It’s the knitter’s equivalent of a book you can’t put down, you know? I’ve knit quite a few patterns out of this book, including the cable blanket I made for my nephew Evan, that was my first post! Oh! 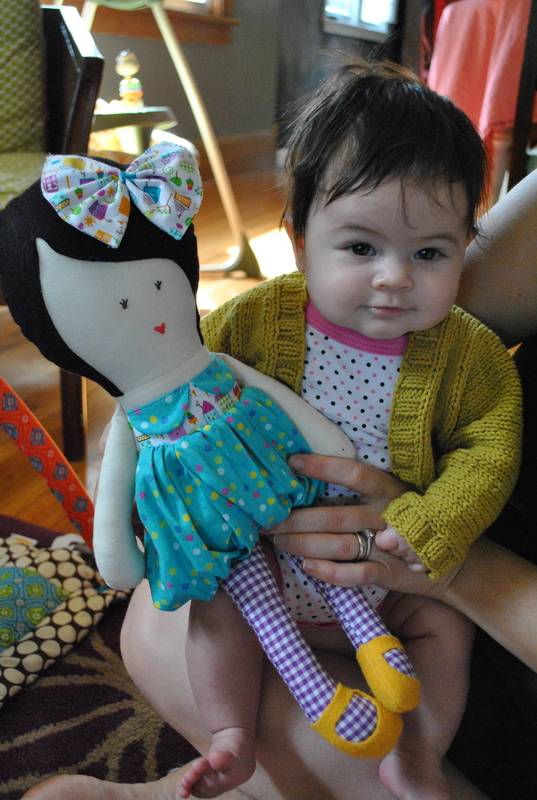 and the adorable doll is a very special gift my friend Olivia had custom made for her. How awesome is that? I just can’t get over it! We call her Iris as well. Iris and Iris of course. I also threw in a couple of photos from an impromptu photo shoot from a week or so ago. Some of my favorite times are when we just all lay on the bed together, admiring her, and trying to make her laugh. Blowing raspberries on her little round tummy. 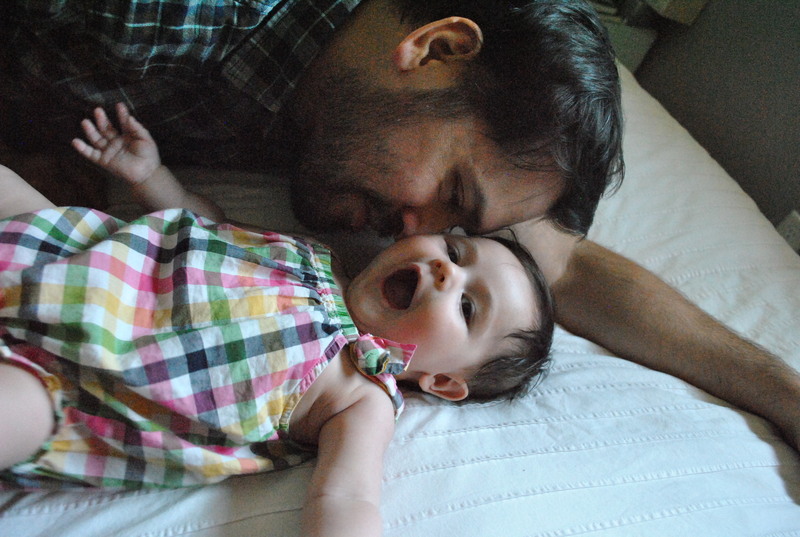 She’s more joy than I ever could have imagined. LOTS of work, but lots of joy.